Buried knee deep in an international site or a large SEO project as we often are, as marketers we sometimes forget about the day-to-day chatter out there on the social networks, forums and RSS feeds. We’re in the information age, after all, and there’s always something new to share, read, absorb and put to use. I don’t mind telling you – if you don’t already know, that is – that all that watchful listening responding goodness take time. So, yeah, sometimes I don’t know the latest buzz. –And yes, sometimes my social networks die for a day or two or three. But that’s life in the big world of Internet Marketing, and that’s another story… or maybe even another post. Now that I’ve made it clear I sometimes fall behind, I’ll turn and point a finger at you. –And I’ll say, “Keep up with the news, people!” Follow those trends. Catch the chatter, use the hash tags, read the alerts and so on. It needs to be part of your daily grind! 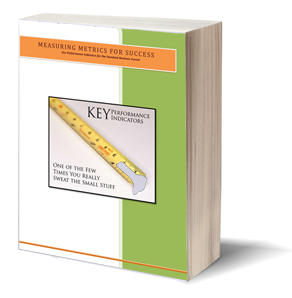 Eventually you’ll find yourself scrambling to learn what’s going on in your industry. You’ll start on that endless search for the perfect program that helps you manage it ALL… For example, with Google Reader approaching its R.I.P celebration, I’m still scrambling to find an alternative. Maybe time management could help in some areas, but remember these three words. Social. Media. Matters. It matters, whether you’re in SEO, SEM, PPC, ABC, or any other acronym you’ve come up with. It just so happens I ran into a great image from Brian Solis (shown at the beginning of this blog post) and at the end of the day, all the updates, RSS feeds and chatter boil down to this. 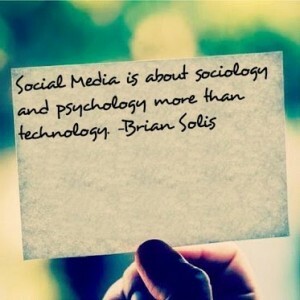 Social Media is about sociology ad psychology more than technology. Now, you’ll find some arguments. Some of those arguments are good; they’re convincing. Many of them – in my opinion, experience, whatever – are wrong. Bear with me a moment, and I’ll explain that. I’ve seen it time and time again. Marketers in different areas try to point to their area as the only one that works. However, experience has shown me this: if you want to be found in search – if you want to market online -, you’ll need to implement a social strategy along with your SEO marketing campaign. Let’s get into the real deal – the nitty gritty, the crème de la crème, the goody bag – of this blog post. While many people accuse businesses of seeing their customers as just numbers, most businesses are marketed by… (drum roll please) marketers. –And marketers understand the value of people. After all, keeping our fingers on the human pulse is our job. Our occupation. What we get paid for. We have to learn the target audience to the best of our abilities. We have to get to know you. Because we don’t just have to convince you that this or that product is useful, oh no. That would be easy. Rather, you have to believe that this or that product is essential to your comfort and way of living. As I’ve said before in many of my rants, the human element has to be part of your strategy, and the above is why. Guess what social media is? That’s right! It’s the human element. I can hear the chatter now. “We need to hire sociologists to get around human behavior buying issues.” Not a bad idea if you can afford one, but until a new formula is found use the tried, tested and proven A.I.D.A. method. Awareness – Will be the driving force behind your brand. From using guest posts, PPC, video, audio… anything and everything that shines the light on your business. Use your SEO, article marketing and video buzz wisely. Don’t put crap out there. It’s not worth it. Start building your community… it takes time. Interest – You’ve used great content and utilized SEO within the confines of the page structure. You have great, marketable meta tags, relevant content and more. Yes, damn it content is still KING. And now you have a fantastic landing page that’s easy on the eyes, loads well, and is measurable. Can life be any better? Desire – You’ve hit pay dirt. Now everything is fitting correctly. Your page speaks of what the reader wants, they can find the information, and they’re going to send their friends there. If you really hit gold then you’ll get that desired natural link you pay thousands of dollars for. Action – The mother load. You have CTA calls to action buttons: from your free shipping (if they order today) to buy buttons, or the immediate CTA “only two left”. SEO’s think they can code and get around any search engine’s algo’s. Some think you just need to understand Google’s thinking. 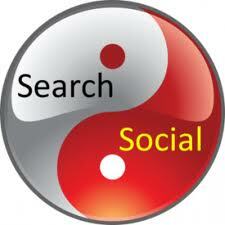 Social media has NOTHING to do with SEO. Regardless of what part of the fence you are standing on, it’s time to incorporate the social media strategies within your SEO audits, campaigns, etc. This is especially true when you are dealing with a global market. Each culture will expect to be reached in their own manner – for the AIDA method to be used differently. Learn to incorporate real, human habits into your marketing methods! In short, get off the SEO/Social Media fence already – you’re bending it!